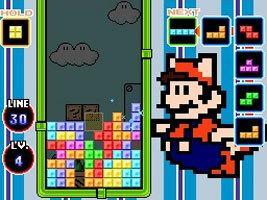 The classic falling block puzzle game returns on the Nintendo DS, fronted by a host of classic characters from the NES. Shapes made up of four blocks fall from the top of the screen. Move and rotate them and fill entire rows to clear them. As well as the main Marathon Mode, there are also several special modes themed around several NES games, including Touch, Push, Catch, Puzzle and Mission Modes. You can also local wireless multiplayer with up to ten other players, or battle over the Nintendo Wi-Fi Connection. Little Mario from Super Mario Bros.
Mario & Luigi from Mario Bros.
Changes depending on the level (see Marathon Mode Cameos below). Metroid themed mode. The background is a vertical tunnel, and if you hit a Metroid canister with the Tetrimino core, then it will destroy your blocks. You also have a Metroid-style energy meter that depletes as you drop blocks. The Legend of Zelda themed mode. The background of the touch screen is a forest, and the top screen is the waterfall from the Zelda title screen. Missions appear on a scroll on the top screen, and you have to clear them before the heart meter depletes on the touch screen. Yoshi's Cookie themed mode. On the top screen is a static puzzle that needs completing, set inside Mario and Yoshi's cookie machine. The blocks appear on the touch screen, with a colourful background based on official artwork from the original game. Balloon Fight themed mode. The background has Balloon Fighters flying around the night sky. Your aim is to drag the caged balloons to the ground. Donkey Kong themed mode. The background is Stage 1 from the game. In Marathon Mode, every 10 lines you clear changes the "theme" of the level. This alters the scene on the top screen, the music, the background of the Tetris tunnel and the rotating sprite on the left. The first 100 are all based on Mario games, but after that other NES games appear. On most of the menus, including loading screens and Wi-Fi, you can see Professor Hector from the R.O.B. series walking around on the top screen. The lower menu screen's background is the opening of the Famicom Disk System operating system. The background of the top screen is from Mario Bros. When on the Records screen, the music in the background is the Hi-Score entry music from Tetris on the Game Boy. During the multiplayer modes, you can use items from the Mario series, including the Super Mushroom, Boo, Banana Peel, Red Shell and Starman. The music during the ending staff credits is an 8-Bit style tune that ends with the Super Mario Bros. Ground theme and Starman music.